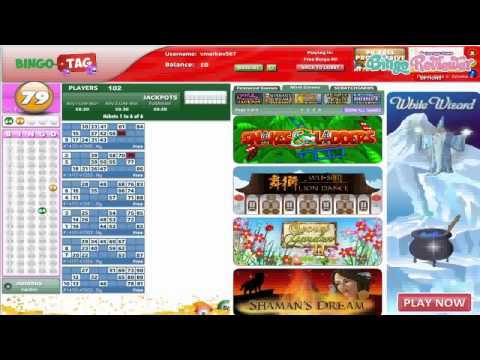 Bingo Tag is one of the latest online bingo sites to enter the market in 2012. The site has what it takes to be a winner and so will you with an exciting marketing scheme and games galore from one of the top developers in the industry. You won’t be searching for a price tag here, instead a tag that is pure Bingo. The homepage is bursting with vibrate hues covering every primary color of the rainbow. The atmosphere shouts fun and instant thrills for the bingo fan. The Wall of Fame boasts all the latest winners from the day before including the Lucky New Players, Biggest Winners and Progressive Jackpot Winners. The Mini Site Map is a convenience for players who want to browse the site with ease. Dragronfish is gaming platform for all the bingo and casino games. The developers of this remarkable software provide a highly efficient instant play access requiring no downloads. Bingo Tag is licensed by the Government of Gibraltar and regulated by the Gibraltar Gambling Commission. One of the most exciting Bingo games offered is the Swedish Bingo version called High 5 Bingo. There are an amazing 5 ways to win with 5 numbers diagonal and across from top to bottom. The lines you can bingo on the bigger the prizes awarded. 90 Ball and 75 Ball bingo are also available for a total of 3 fantastic variations all offering a bingo room with a Progressive Jackpot. Play Mini Games inside each room without having to go to the lobby to access. Chat Moderators are always on hand to help with any questions and provide a fun atmosphere including interactive fun and rewarding Chat Games. Featured Slots include some of the best around with Bejewled, Cleopatra, Monopoly and Shopping Spree. The extensive list of Slots offer big Jackpot wins and fun filled special features that can be played for as little as one penny per line. Without a doubt the most impressive offer is the Free Bingo games. There is a staggering £6,000 in cash prize given away every single month. There are not too many online bingo sites that offer that and Bingo Tag is well worth joining just on Freebies alone! Refreshing new Promotions are always available and correlate nicely with any given months events like holidays, events and seasons. Weekends will have you staying at your computer all weekend long with fabulous offers valued up to £1,500 in prizes. The BFF Loyalty Program is a great way to boost your Bonus percentages and earn awesome benefits. Move through the five tiers and watch the rewards grow with Cash Back, Exclusive Promotions and more. Status is determined by the amount of deposits made. The last two tiers are by special invitation only and are for the most loyal players of all. Bingo Tag offers an impressive of Progressive Jackpots and Guaranteed Jackpots that take place daily. Players can win up to £1,000,000 in the Coverall games. Guaranteed prizes range from £50 to £1,500 in Jackpots. We rate Bingo Tag with 4.25 Pink Hearts. There are a few things I like about this site and a few things I don’t. First off, they offer something called Free-4-All free bingo which is available to players every day from 7am to 7pm where you can win cash for at no cost to you. Obviously this is definitely one of the good things. It’s free and it actually offers pretty good prizes. They also offer a variety of payment methods which I was pleased to see. I also like that all players have the option to play free bingo, not just depositing players which is often what sites like to get you on. I love playing their team bingo. Not all sites offer this and they should! It makes things fun and competitive and spices things up a bit. Now for my complaint. I had a bad experience with receiving one of their bonuses. It only happened once but it caused such a problem on both ends. It took forever to have it placed into my account, over a week almost! That’s unheard of! Other than that, not too bad though. Another great example of a good Dragonfish site that looks impressive. I know that it is not the most important thing, but I prefer to see sites with a good design than some weird sites that I don't even have the wish to try. Back to BingoTag, a site that has over 500 regular players, at all times, so it is a good place to enjoy a good competition. I think that the No Deposit Bingo offer is expired, and now you get the 200% bonus when you deposit at least £10. Fairly regular offer. If you like to get the most out of your money, not a bad idea to mark mondays, for they have Happy Hour (actually 2 hours) when you get double points and a 100% reload bonus. As with the other Dragonfish sites, there are 75, 90 games, as well as High 5 Bingo that I ended up playing almost exclusively. I was happy with the deposit bonus/welcome offer they start off new players with here. It is not the most unique I have seen but it certainly does the job nonetheless. When players sign up and make an initial deposit of £10, you wind up with a total of £30 to play with. That means you get £20 free! That is a pretty nice way to start out a brand new gaming experience, without having to dig too deep into your pockets. They also have some pretty good jackpots to try for here as well as a decent selection of bingo. They have three types to choose from, including 75 & 90 ball as well as high five bingo. They’re loaded with all kinds of jackpots including coveralls and progressives. Team bingo is also another nice addition to the site and so is the endless array of free bingo opportunities!